Things change quickly in the English Premier League - Peterborough Phantoms are perfect proof of that. The city side went into Christmas in possession of a five-point lead at the top of the standings. They were scoring goals and winning games for fun. Turn the clock forward to the end of the opening weekend of the new year and that cushion become a five-point deficit. The goals have dried up and the victories have turned into defeats. Phantoms have now lost four matches in a row and, more worryingly, have gone eight periods (that’s more than two-and-a-half hours) without finding the net. They drew a second successive blank last night (January 3) when suffering a 3-0 reverse at the hands of Basingstoke in the two sides’ second top-of-the-table clash in the space of 24 hours. The previous one in Hampshire had followed much the same pattern and ended in exactly the same scoreline with Phantoms finding no way past Bison netminder Jon Baston all weekend. They tested the Finnish goalie 65 times over the course of the two nights (40 of them last night when they actually out-shot their fellow high-fliers) but he was equal to them all. Even when he was beaten early in the third period, Phantoms couldn’t end their goal drought as a Darius Pliskauskas shot pinged the pipes. It’s a scenario which has left coach Slava Koulikov baffled and frustrated. He said: “We didn’t play too badly again, but it is something new for us to be in a position of not scoring a single goal in a weekend. “I don’t mind admitting it is an uncomfortable situation, but the guys gave me everything and you cannot teach how to get the right bounce. That comes down to luck sometimes and it just didn’t happen for us. “The puck just wouldn’t go in. We had a lot of good chances across the two games and to come out with two zeros is almost unbelievable. “The commitment is there and we just have to keep working and hope we can find our touch again. 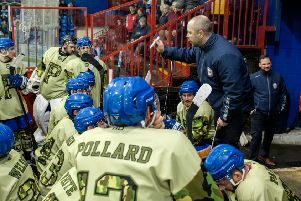 Koulikov and his players could have been forgiven for thinking they were experiencing a bout of déjà vu as Basingstoke took control with two first-period goals for the second night running. Aaron Connolly escaped from the shackles of Cam McGiffin to rifle the visitors ahead and Joe Greener doubled their advantage when skating across the zone before guiding his finish into the bottom corner. Phantoms, without defenceman Scott Robson due to a knee problem, did their best to keep Baston busy at the other end with Edgars Bebris, Marc Levers and Robbie Ferrara among those to see efforts kept out. The hosts didn’t always look keen to pull the trigger – probably a result of a lack of confidence due to a lack of goals – and when they did, it didn’t always go to plan. Milan Baranyk succeeded only in slamming an effort early in the second period into the shoulder of team-mate Lloyd Gibson, who briefly left the arena in a sling before returning to play a full part in the remainder of the game. A Craig Scott effort sparked a bout of pinball in front of the Basingstoke net before Baston grabbed hold of the puck while Pliskauskas declined another glorious shooting opportunity in favour of attempting to play in Scott, who was snuffed out by covering defencemen. It was a session largely dominated by Phantoms, but they got no reward while only a fine Janis Auzins save from Ryan Watt denied Bison a third goal on a breakaway. Pliskauskas came closest of all to a home breakthrough in the opening minute of the final stanza when finding the frame of the goal, but it was to be another frustrating chapter in the toughest spell of Phantoms’ season. And their current plight was summed up by one late passage of play. Phantoms simply could not get a telling touch in the most frantic of goalmouth melees as bodies and sticks flew in all directions, but Basingstoke escaped and struck a fortunate empty-net goal as Connolly’s second of the night received a helpful deflection to take it into the gaping target with Auzins having been pulled in favour of an extra skater. Phantoms remain second in the EPL table and return to action at Sheffield on Saturday (January 9) before hosting Milton Keynes, who beat them twice over Christmas, the following night (January 10). They also have their two-legged EPL Cup semi-final against MK looming large on the horizon. The first leg in Buckinghamshire is on January 13 with the return a week later at Planet Ice.